Infinity Home Improvement was founded in October of 2000. It was built on the principle of providing Michigan homeowners top-quality products and excellent service with the highest level of customer satisfaction at competitive prices. Owners Mark Adams and Bob Heilman bring 84 years of combined home improvement experience to the business. Our company started with Gutter Helmet®, the first, best and number one gutter protection system in the world. We believe in bringing our clients nothing but the best, and with a brand that’s been #1 in America for more than 30 years, we were sure we couldn’t go wrong. And we were right! 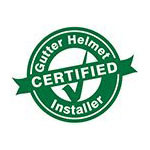 Gutter Helmet® brings with it the promise of lifetime protection and peace of mind—two things we work hard to achieve in every installation. Our topnotch products and focus on superior customer care allowed us to extend our service offerings to more and more homes across Central and Southern Michigan. After building a clientele of 50,000+ customers, we expanded our product offerings to include BetterLiving sunrooms, Omniguard windows and doors, BCI replacement tubs and showers and American Standard walk-in tubs. We also became a GAF Master Elite™ roofing supplier (less than 3% of the roofing contractors in the US qualify!) and an Owens Corning Top of the House™ insulation contractor. That’s just a few of the many home improvement services now offered by Infinity Home Improvement. Call our office today to get a free, no-obligation quote or fill out our online form to schedule a visit from one of our sales representatives. Let us know how we can help protect your home and improve your life today!